It’s venues like Cannoli Bar that make Melbourne interesting. 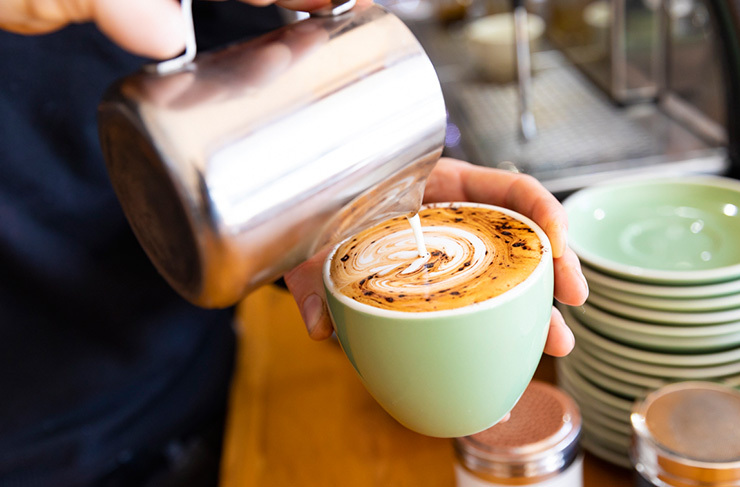 Forget three-storey concept restaurants and $250-a-head CBD degustations. If you want to taste the real Melbourne (without tapping a keg from the Yarra), head to the ‘burbs. 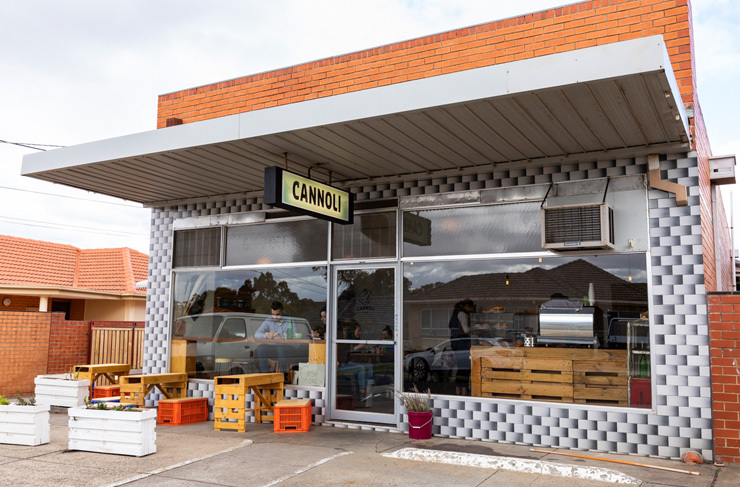 Exhibit A: Melbourne’s brand new cannolificio (cannoli store), hidden in the very ordinary streets of Avondale Heights. Cannoli Bar took us by surprise. One minute we’re driving past mustard-brick houses and trimmed front lawns, next we’re sitting on a palette crate in the sun, eating traditional cannoli by the handful and planning our career move to Sicily. Italian desserts will do that to you. 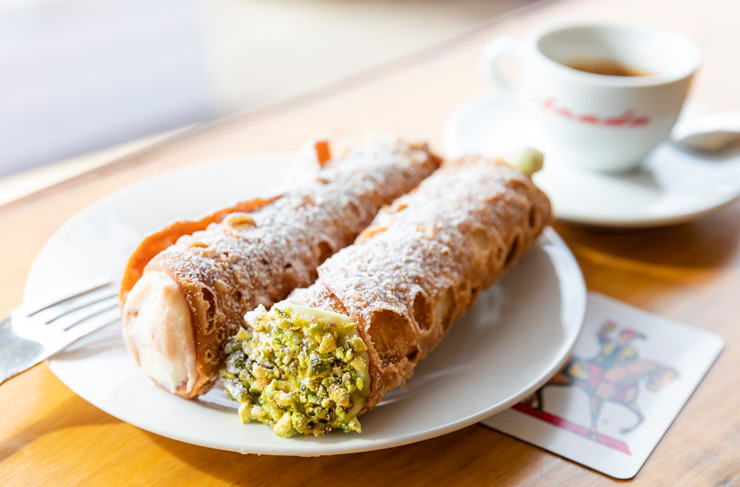 The news of Cannoli Bar has swept over Melbourne like a ricotta tidal wave the last few weeks. It’s the brainchild of Italian-born Carlo Mellini, and his dad, Achille. Carlo’s been obsessed with traditional Sicilian cannoli since he was a kid. And the idea of opening a dedicated cannolificio had been percolating for a while. When he found this old Milk Bar site in Avondale Heights, he pounced. First things first: what exactly are cannoli? Well, they’re fried tubes of pastry dough, so crispy and crumbly that half will end up in your lap (especially if you eat them in the car). Traditionally they come from Palermo and Messina. Inside they’re usually piped with sweetened vanilla ricotta, but you can really spin them any way you want. Achille is the genius responsible for actually making the cannoli at Cannoli Bar. He worked at the family’s Pasticceria Mellini back in Rome, before doing stints at Grossi Florentino and Brunetti, then moving on to become the pastry chef for the entire Gradi Group. This guy’s made more cannoli than you’ve had hot dinners. The bar itself is classic Melbourne westside. A checkerboard tile runs across the exterior. There’s an Avondale FC poster in the window. The sign hanging out front screams ‘CANNOLI’ in all-caps. No point being subtle about it. Push open the front door and the scent hits you straight away: a zephyr of vanilla, sweet pastry and strong espresso. It’s like a big flour-dusted Nonna hug. The bar is rough cut pine, topped with glass display cabinets. You’ll spot the empty cannoli tubes, stacked like Dead Sea Scrolls, plus traditional biscotti, homemade zucchini pizzas, almond biccies and cassata siciliane. The cannoli themselves come in a few varieties. We recommend starting with your classic vanilla, then double parking with something more exotic. Maybe pistachio crumbed, or the sinfully good Nutella cannoli. Whatever you order, the guys will pipe in front of your eyes, and nothing stirs the stomach like watching real Sicilian cannoli get piped. Each one will set you back about $4.50. Grab a seat up by the window and tuck in. The pastry is bang-on. Bubbled and toffee-brown, that strange crisp-crumbly texture, offset by pillowy ricotta filling. Goes great with the Nomadic Roasters coffee—Carlo deliberately went for a roast that complimented Italian desserts. Nothing too floral or fruity. You might notice the two old pasta machines sitting on the old ladder. Carlo and Achille made the store’s first 2000 cannoli on those bad boys, but sadly they couldn’t keep up with demand. The boys now make the shells on an electric pasta maker. Less romantic, maybe, but it allows them to churn out hundreds of fresh cannoli a week. And they’re gonna need to—demand has spiked in the last month, and it’s only going to get busier. Want to learn more about Cannoli Bar? Check out our Directory page.